How do betting exchanges work? Are you an Australian wondering how a betting exchange works, we will explain how to back and lay on Betfair. What is a betting exchange. Betfair Australia. Betting Exchanges started in the UK around 2001, and Betfair soon became the leading player. The principles of a betting exchange are very similar to that of a stock exchange in that a punter can either back (i.e. buy) or lay (i.e. sell) an outcome on a race or sporting event. The punter puts up the price at which they wish to back or lay, and hope that somebody takes the contrary view and accepts their bet. Therefore you are betting against other individuals, not against the betting exchange. The betting exchange makes money by charging a small commission on all winning bets. 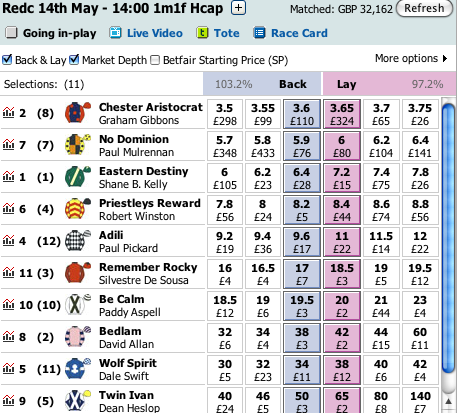 Below is a screen print of a UK horse race on Betfair, you can see that if you wanted to back the favourite Chester Aristocrat for instance there is currently £110 available at a price of 3.6, if however you thought that Chester Aristocrat isn't going to win, then you could lay this horse at a price of 3.65. When you make a bet you don't know who you are betting against, however the betting exchange will always ensure that everyone backing or laying has sufficient funds to cover their bet. Unlike a traditional bookmaker, a betting exchange doesn't take any risk, in affect it just acts as a broker matching bets. The nature of a betting exchange is for it to really work you need a very high volume of punters, as without this volume you can never be confident of matching bets at reasonable odds. What this has meant is that it is very hard for new betting exchanges to get off the ground. As a consequence over the last ten years Betfair have established themselves as the number one betting exchange, and over 95% of betting exchange wagers are made via Betfair.